The U.S. House Intelligence Committee on Wednesday released a trove of social media advertisements placed by Russian interests during the 2016 presidential campaign. And three of them featured Sen. Bernie Sanders (I-Vt.). 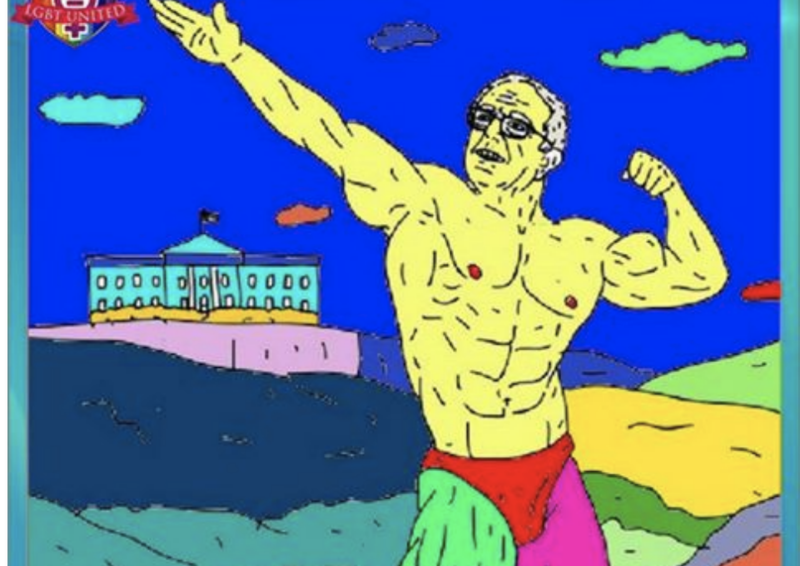 The most instantly memorable Sanders-themed ad was for a book called Buff Bernie: A Coloring Book for Berniacs, featuring line drawings of an exaggeratedly muscle-bound Sanders in a variety of bodybuilder poses. The ad was placed by a group calling itself "LGBT United," but it was paid for in rubles, and the funds were transferred to Facebook by Qiwi, a Russian payment processing firm. You'd think somebody in the accounting office at Facebook would notice such things. This particular ad cost "LGBT United" 111.49 rubles. At the current exchange rate, that's ... um ... a whopping $1.91 American. The ad ran for only a single day in March 2016, attracting 848 impressions and 54 clicks. In general, the ads were designed to sow division in America on specific issues and the campaign in general. Colin Stretch, Facebook's general counsel, told the committee that the Russian effort "was undertaken by people who understand social media." Perhaps, but they don't have an especially firm grasp of the English language. 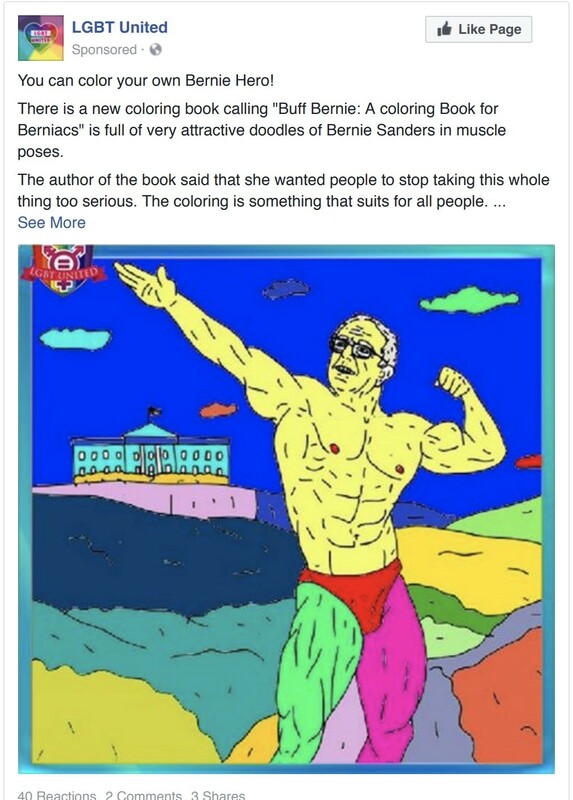 The text accompanying the "Buff Bernie" ad read, in part, "The coloring is something that suits for all people." Two other Sanders-themed ads were more pointedly political and included text that fractured the language in sometimes hilarious ways. One ad was supposedly placed by United Muslims of America, again paid for in rubles via Qiwi. The caption, below a photo of Sanders apparently speaking in a Muslim setting, read: "Sanders Win With Help From Arab And Muslim Americans Is No Surprise." Gee, that almost makes sense. The ad was the Facebook equivalent of a tree falling in the forest. It received 11 impressions and zero clicks. It cost its sponsors 5.92 rubles, or one thin American dime. The third ad capitalized on the controversy over the Clinton Foundation's acceptance of big donations from foreign entities. Best fractured English: "The Clinton Foundation is nothing more than an 'organized crime' at its finest." This ad was the most successful of the three, racking up 1,938 impressions and 222 clicks, all for the low, low price of 500 rubles. Or $8.58 U.S. These three ads are more laughable than anything, but the Russians' method was to throw a whole lot of material against the wall and hope some of it stuck. The ads cost very little to create — this clearly wasn't the A-Team of Russian-English translators — and were very cheap to run. As with an email scam, they only need to work a small fraction of the time. Daddona was unaware of the Facebook ad until contacted by Buzzfeed News after the House committee released the images. "I feel pretty violated and very confused!" she wrote Buzzfeed in an email. "I have never been approached by any Russian groups wanting to promote this book and would NEVER approve of anyone using my art to push their own agenda without my permission." Besides, the ad obviously didn't sell very many books.